Bloggling Brooks: Waiting on God...For FOREVER! If you know your bible even a little bit you know this is true. I am not a patient person. I want what I want, preferably before I ask, but if absolutely necessary I'll take it within a minute or two of making my request. "It is good to wait quietly for the Salvation of the Lord." Not my favorite thing to do, this waiting. For once in my life I thought, "ok, I can do this." I'd rather some immediate results but at least it was something. God had given me a word to cling to regarding my situation. So I spent my year doing just that, waiting. JUST that, only that. I sat idly by and waited. Waiting on Me means directing your attention to Me in hopeful anticipation of what I will do.... Waiting on Me is the way I designed you to live... I created you to stay conscious of Me as you go about your daily duties. The Lord is good to those whose hope is in him, to the one who seeks him. Immediately after this is my verse, it is good to wait quietly for the Salvation of the Lord. 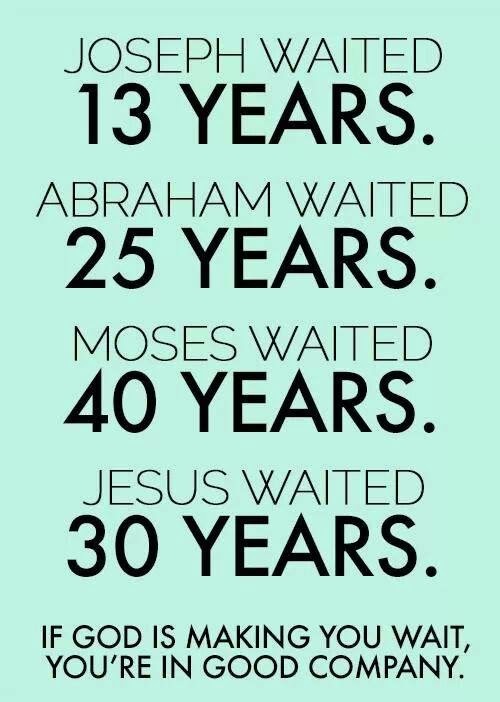 If you are waiting on God, take heart! He will deliver. You are free from the burden of fretting over it, incidentally freed up to seek Him and seek His kingdom! To leave a comment click here link! God must be speaking today thru Lam: 3...this is the third time today I have received this scripture...must be important!!! I use to be a utterly impatient human...No one moved fast enough for me. I wanted what I wanted immediately! So God had a work to do! In the past few months I have gone over in my thoughts, exactly when and where, I had become so patient. However, it happened I have gone from darkness to light in the area of patience. It is not hard for me anymore and I am thankful. In being a widow, you have to wait on everything, nothing comes quickly. If I want my computer worked on, I have to wait until one of my sons comes by..If I want a curtain hung or ceiling light changed, I have to wait until a tall person comes by...I would be in the pit of despair at this time of my life, If I had not learned this over the years. It must have snuck up on me, for I certainly did not have in my childhood, nor as a young woman. So, just wait because James says "the trying of your faith works patience." It will come somewhere along that path of waiting and with it the stresses of life are abandoned and life becomes a little sweeter as you stop and smell the roses. It is a lot more pleasant in my life now. I do not even have to try to have it...it is just there! Which American Idol Judge Are You?